Looking back on a wonderful week of teaching Straightness Training in Pretoria, South Africa. In 6 days I taught 21 combinations in 44 lessons. I would like to thank ALL students, horses, riders and observers. You did an amazing job. You have opened up, faced your challenges head on and learned so much. I’m very proud of all of you. We’ve seen breakthroughs, transformations, true connection. It’s been beautiful to see the growth in all of you. FOR BEING BRILLIANT AND MOTIVATED STUDENTS! You worked on all the exercises in walk in the training pillars groundwork, longeing, work in hand and riding and balanced trot transitions in the training pillars of groundwork, longeing, work in hand and riding. We had a wonderful mixture of starting and advanced horses and riders. We explored teaching the exercises in standstill. LFS on the circle and on the straight. I even taught the haunches in to some of you. We used the training pilars groundwork, longeing, work in hand and riding to teach and build up the strength and flexibility of horses and their trainers. With the advanced students we refined the quality of all lateral exercises in walk and studied the correct seat in half pass and pirouette. We practiced balanced trot transitions through increasing energy from the inside hindleg. Through all work we aimed for more physical, mental, emotional and spiritual balance. Your willingness to share your lessons with the other participants is admirable! We had various interested riders joining in every day, among them were an endurance rider, show jumpers, a veterinarian and Parelli instructors. Thank you the stable manager Rene de Beer for having C.C. Equestrian Centre in a tiptop shape for our morning lessons. Thank you Anneke Roodt for having us at your wonderful indoor arena at McGregor dressage facilities for our afternoon lessons. Those thunderstorms! And I’m grateful to Zaneta Georgiades for doing such a amazing job, dedicating your life to the horses, studying Straightness Training and organizing this clinic. I’m so proud of you and your horses! I’m so happy that you are now the first trainee instructor in Straightness Training in South Africa. I’m sure lots of horses and riders will benefit from your teaching! Looking forward to see everybody during the next clinic in May 2015. Can’t wait to see the progress in all of you! If you would you like to be coached by me remotely. YOU CAN! 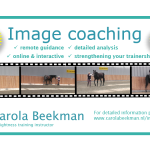 With Equestrian Image Coaching designed by me to help YOU learn, with guidance from a distance.